With intuitive online dashboards, Empresa exposes the power of your data using "at-a-glance" insights into a range of HR activities. Empresa administrators have complete control over their notifications by allowing you to create rules and filters, so you are only notified in the dashboard for the things that you choose. Automated absence management in Empresa helps reduce organisation's absence-related costs by quickly altering you to absence issues. The company dashboard can show at a glance see who is on leave or absent. Spreadsheets and paper-based systems are unable to provide the level of functionality that automated HR software can offer. Empresa can deliver real-time information, saving staff valuable time and effort, which can be better directed towards delivering services to customers. Many businesses are stagnating in a quagmire of spreadsheets, reports, documents, and paper binders. The best way to focus on what really matters is by creating and using HR dashboards for your organisation. 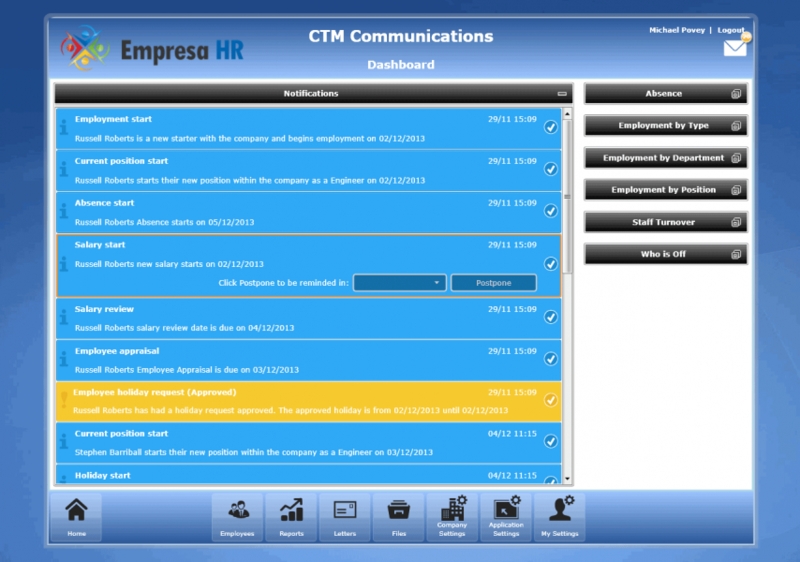 When you need concise, actionable information about your organisation's performance, choose Empresa HR. In conclusion, the Empresa company dashboard provides: potential reductions to unplanned employee absence, increase administration efficiency, and improved absence management.